8 Limbs is partnering with City Arts Magazine to profile local artists who practice yoga at 8 Limbs. For the June issue, we profile Etta Lilienthal. Etta Lilienthal is a scenographer, production designer and visual designer residing in Seattle. Her recent projects as scene designer have been for theatrical and dance performances staged across the country including Seattle Repertory Theatre, Intiman Theatre, Seattle Children’s Theatre, A Contemporary Theatre, New Century Theatre, Maureen Whiting Dance Company, 33 Fainting Spells, Spectrum Dance Theater and the UMO Ensemble. Learn more about Etta and LILIENTHAL|ZAMORA, a collaboration with Ben Zamora in the fields of theater, dance, installation and architecture at www.ettalilienthal.com. I began to practice yoga in my early twenties when it became apparent to me that my body and mind needed to become more flexible. I was determined to touch my toes, and when I first did I realized that I could create visible in myself, both physically and mentally. I first saw yoga as the opposite end of the scale of my fast paced, physically active lifestyle and I felt the benefits of continued practice. I first took a class in college in 1994, but truly began a regular practice when I moved to Seattle in 1999, thirteen years ago. Yoga gives me the patience and flexibility of mind to create in the moment. As I have matured, the practice has allowed me to focus less on the end product of my work and more on the collaborative process of creation. It has also taught me how to breathe and how to control my response to difficult moments with my breath. Making art collaboratively is a process trusting both myself and the other person. My yoga practice, both asana and meditation, is a constant underlying support for my interactions during the process of my work with my design partner, Ben Zamora in our collaboration LILIENTHAL|ZAMORA. 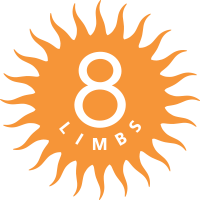 8 Limbs not only offers me practiced teachers, flexible class times and a supportive community but also has continued to support me as a student and artist through out the years. I have art directed the design of several 8 Limbs studios as well as the latest Blue-Ray Yoga DVD for 8 Limbs. Many of the teachers and students at 8 Limbs are invested in the creative community in Seattle, Theater, Art and Dance and I feel a part of this community. Over the years 8 Limbs has also encouraged me to move deeper in my practice by offering meditation classes, silent retreats and workshops.